Chester, PA (Nov. 10, 2014) – The date has been circled on both teams calendars for almost a year and now it is time for the two to battle. No. 10 Widener (9-0, 8-0 MAC) and No. 15 Delaware Valley (9-0, 8-0) will square off Saturday at Leslie C. Quick Jr. Stadium with the Middle Atlantic Conference title and an automatic berth into the NCAA Tournament at stake. Game time is 1:00 pm. It is the fourth straight year Widener is going into this contest with at least a share of the MAC title and the possibility of going to the NCAA Tournament on the line. This also is the first time these teams heads into this contest with 9-0 records. A victory would give Widener its 20th MAC title, its 14th trip to the NCAA Tournament and its 12th undefeated regular season. The Pride also are trying to get to 10-0 for only the sixth time in school history. 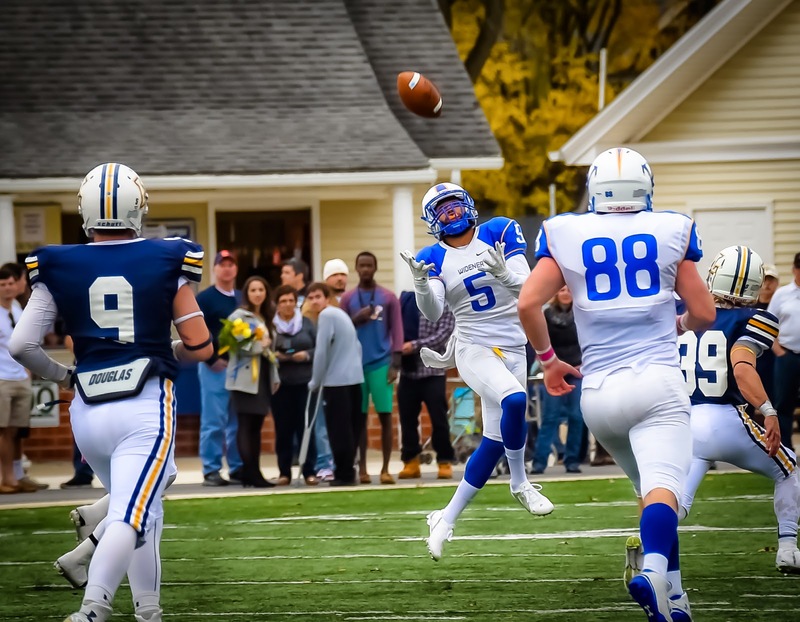 Widener has not trailed all season and has not allowed a touchdown in the third quarter all year. The Pride last week were third in the NCAA East Regional Rankings and the Aggies were first. This is the primary criteria used to place schools for the 32-team NCAA Tournament, which begins November 22. The Pride have been nationally ranked most of the campaign for many reasons. The defense is the key principle by remaining number one in the country in rushing defense with only 42.9 yards allowed per contest. Helping that figure was the fact the squad yielded minus-19 rushing yards last Saturday vs. Stevenson and minus-13 yards September 27 at FDU-Florham. The unit also is second in the nation with 11.2 tackles for a loss per game, fifth in turnover ratio (26:7), third with a .458 red zone scoring percentage, sixth with 4.00 sacks per game, sixth with 10.1 points allowed per contest and 15th with 251.9 yards allowed per game. It certainly does not hurt to have three all-conference returnees on the defensive line in Stacey Sunnerville (Freehold, NJ/Freehold), fellow junior Shakore Philip (Bay Shore, NY) and senior John DiBiase (Mount Laurel, NJ/Lenape). Sunnerville, who was tabbed second team All-MAC, is third on the squad with 41 tackles and also has seven tackles for a loss. Philip was first team All-MAC as well as second team All-ECAC South and DiBiase was Honorable Mention. Linebacker Kevin Burns (Collingdale, PA/West Catholic) paces the team with 59 tackles and a league-leading 17 1/2 for a loss with fellow senior Brandon Harper (Blackwood, NJ) second on the squad with 58 tackles. Sophomore Alex Stewart (Pittsgrove, NJ/Arthur P. Schalick) had a school-record three blocked punts October 18 against Wilkes and senior Ameer Sorrell (Port Norris, NJ) has four touchdowns this year that include three blocked punt returns. Sophomore Sean Titus (Lancaster, PA/Lancaster Catholic) has had a monster year at safety. He has a league-best seven interceptions for 168 yards, including a 96-yard return for a touchdown last Saturday vs. King’s. Senior All-America receiver/returner Anthony Davis (Upland, PA/Chester) continues to be a menace for any opponent and once again is having another solid campaign. He is 42nd in the country with 814 receiving yards, 90th with 123.8 all-purpose yards per game, fourth in the MAC with eighth receiving touchdowns and sixth with 5.3 receptions per game. Davis is first in school history with 235 career receptions, 6,149 all-purpose yards, 3,525 receiving yards and 1,685 kickoff return yards. He also is second with 39 touchdown catches and fifth with 43 touchdowns. He has been voted All-America the last two years, first team All-MAC all three seasons, is the reigning MAC and ECAC South Offensive Player of the Year and this year was cited a Preseason All-America by four publications. Sophomore quarterback Seth Klein (Wernersville, PA/Wilson West Lawn) for the second straight year has excelled, one season after being picked the MAC and ECAC South Rookie of the Year. This season, is 18th in the country with 25 touchdown passes, 37th with 253.3 passing yards per game, 38th with a .631 completion percentage and 51st with 258.3 yards of total offense per contest. Mike Kelly has won his first nine games as head coach, the longest such winning and unbeaten streaks in school history. The previous unbeaten run was held by Dutch Sommer, who went 5-0-2 during his only season in 1913. The Pride have outscored their opponents this season 361-91 that includes 119-23 in the first quarter and 55-3 in the third.